Fun & Inspiration Do You Wake Up at the Same Time Every Night? This Could Be the Reason Why! We have spoken previously about how it can be normal to wake up in the middle of the night, but it should be a natural waking up. However, what does it mean if you wake up at the same time every night and don’t feel good? 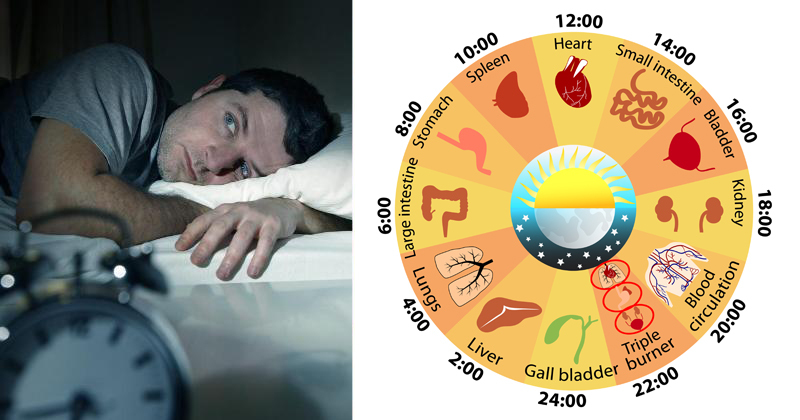 A little something called the Chinese Organ or Body Clock may be able to tell you what is going on with your body. The Chinese Organ Body Clock works on the premise that chi or qi moves through the body at different times during the day. At different times during the day, chi moves from one body system to another to restore and strengthen. (source) This cycle takes 24 hours and each system is given 2 hours of chi charge time. Thus, if there is a blockage that hinders the flow of energy from organ to organ or system to system, that blockage could force you to wake up. Physical, emotional, or mental health problems can all create blockages, and knowing what might be wrong can help a person feel better in no time. Stress, paranoia, or confusion could also be keeping you awake. If you find this to be the case, try some meditation, do a bedtime yoga routine, or repeat some calming mantras. However, if you are experiencing feelings of judgement towards yourself or others, or resentment, that may be keeping you up as well. It is important to let go of the mistakes you or others have made and expel resentment. Acceptance and forgiveness are important. Anger, guilt, and rage are all associated with this time. An excess of any of these feelings could cause you to wake up. It is important to try to release that anger and try to see clarity in any troubling situation. This time is associated with grief and sadness, and waking up during this time could mean something has happened in your life that makes you feel depressed. It is important to accept these feelings, grieve appropriately, and carry on with your life. Emotionally, this time is associated with a feeling of being stuck, defensive, or impatience about lack of movement or growth in life. This is the perfect time to chant some uplifting morning mantras. This body clock continues throughout the day and there are some things you can do to help the process along.